While in Japan, I want to learn more about the Japanese culture and expose myself to the world of nanotechnology. Eating authentic Japanese sushi, learning how to speak and write in Japanese, and simply communicate to the average Japanese citizens would be an honor in itself. I want to learn Japanese and be able to say a few phrases fluently when I return home. Traveling abroad to a foreign country will no doubt provide me with firsthand experience of the Japanese culture and expose me to a research program that I believe will strengthen my knowledge in a technology. The NanoJapan Program is important to me because it will give me the opportunity to help another country after a devastating disaster. In particular, I look forward to visiting Minami-Sanriku, a region that was decimated by the 3/11 earthquake and tsunami, at the end of the three-week orientation program. I have never participated in a relief project, so I am very eager to get this type of experience and tell my friends and family about how much it will impact me personally and spiritually. Another goal of mine is to use carbon nanotubes versus conventional platinum nanoparticles will be to increase the voltage output while reducing the amount of oxygen in the system. 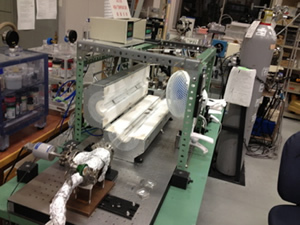 University of Tokyo’s research is the most interesting to me because their group uses the chemical vapor deposition method in which I plan to use at Morehouse. This experience will be very useful in my life long goal of mass producing a more efficient 100% electric car. I want to enjoy the wildlife of Japan. 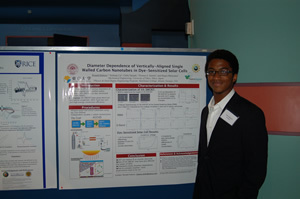 I want to be an expert on research so that I can replicate or continue my research at my home institution. Taste as much of Japan’s authentic cuisine. Become great friends with someone from Japan and keep in touch after the program. Week 6: Research in Japan vs. in the U.S.
My first day in Japan was not entirely what I expected. When I walked out the airport and headed to the Sanuki Hotel, I could not read any of the signs. I have never felt so illiterate and lost. As we approached Tokyo, I saw the tall buildings. What really surprised me was how large the city was compared to most US cities that I’ve been to. I thought the city would be easy to distinguish where it started and ended. Looking from the outside in, it seemed like all of Tokyo was downtown. Packard-sensei was so helpful in telling us what to look out for, where to go for what we needed around the hotel and finalizing our plans for the trip. Unfortunately, by the time we finished the orientation, I was already tired and dozing off from the 13 hour flight. Right there I knew that jet leg would hit me hard later that night. She took us on a tour of the area, the air was much different from the US. The air was fresher and had a distinct smell to it. The streets were much quieter than streets in US cities and people would fly by on bike as if you weren’t there. It was all so different and foreign and I really understood what it felt like to be foreign in another country. 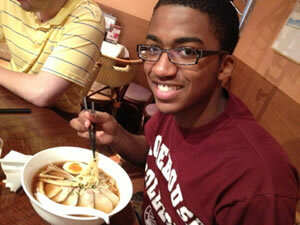 For dinner, we ate at a Ramen shop not too far from the hotel. We passed by a few ramen shops but none were as cheap as this one. I had a major headache and I knew that if I didn’t force myself to eat that I would have been starving when I wake up in the middle of the night. While we ate, I think I was the only one who couldn’t stay up to finish my food. I was completely out of it. I got to my bed about 8:30 and fell right to sleep. I woke up at 2 AM and knew that I had to find something so that I could go to sleep again so my internal clock wouldn’t be to far off from Japanese time. I turned on the TV and found a lot of interesting things. The channels are not normal. The numbers on the remote are preset to Japanese channels so trying to type numbers greater than 12 would not work. They had one channel in English but I didn’t want to watch that because I would not get a feel for Japanese TV. Sure enough, I was right. Each channel would play hundreds of commercials about the same thing: either an energy pill, US movie in Japanese, or some type of vacation to some remote place. Some of the channels would have music videos instead of commercial. I thought that was pretty cool. Around 3 AM though, most of the channels went offline. I’m guessing this is so that people go to sleep. The thought of TV channels not being on 24/7 was shocking to say the least since I had nothing to do before I had to be ready for Japanese Language class in the morning. Luckily I fell asleep again before I had to get ready to head to class with everyone. The Japanese language class is probably the most intense language class I have ever taken. The teachers expected us to know Japanese by the time we walked through the doors. They spoke more Japanese than English and pounded us with lessons and topics every class. One day we had 15 minutes before class was over and she taught us three more in depth lessons before we could leave. Despite the 4 hours of constant Japanese, the class has been very productive and I learn so much everyday in class. The lessons taught in class are easy to understand so that I can apply them in my daily life while living in Japan. I have not yet had a full conversation with a clerk where I am not just saying Hai after ever sentence he/she says out of confusion. I think after the end of next week I should be more confident in speaking in Japanese. A few challenges I had with talking to some of the Japanese students, from the KIP program that we met with, were trying to find the right words to say. There were instances were we would have a conversation but when it came to describing something, it was hard to describe it since I automatically knew what I was talking about. The conversation eventually turned into a game of Taboo. I talk about something and then try to describe it using other words that he might know and motions and then he would do the same when he/she would try to describe what she was saying. It was kind of an introduction to what professors and teachers have to do when giving a lesson. Some professors don’t try to make a lesson understandable, but the ones that do use this technique are considered to be some of my favorite and best professors. They give me enough information where they don’t give me the answer and I can find the answer out on my own. This is good communication practice for me since I might want to go into academia after I earn a PhD in Engineering. Tokyo public transportation is very different from any US public transportation. First off, the metro system is very reliable. When the schedule says the train will arrive at 7:38, it actually arrives on time. When I am on the train, it seems like everyone uses the train, not just lower class citizens. When I use the Marta in Atlanta, mostly lower class workers use the subway it the environment seems very depressing. In Tokyo, I don’t get the same vibe. For once I was actually excited to ride the subway. The people riding the subway also mind their own business are very quiet. When I step away from the NanoJapan group, all I can hear are my friends talking and the Subway stereo playing the station jingle or the announcer telling us where we are. A big adjustment for me was cramming into the train when I thought there was no more room left. Apparently, Japanese people don’t mind touching each other in confined spaces unless it is inappropriate to make space for a few more people. Also it is frowned upon to eat ice cream in the subway even though the have ice cream vending machines. I don’t understand the point of that if I have to wait till I get home to eat a melted ice cream cone. One thing that everyone does is either listen to music, read a book, or sleep. Sleeping caught me off guard because I would think that someone would have stolen their belongings. But I have also noticed that Tokyo is a very safe place. Children from 5-18 walking to and from school, using public transportation, and overall being completely independent of their parents when it comes to transportation. Shibuya Crossing:What seems like chaos in the streets is real complete order as people walk across the streets. The core-Japanese values that we talked about during pre-departure orientation are definitely noticeable. When I talk to some of the KIP students, they are very respectful towards me, and one another. They don’t say anything to upset anyone, even if someone might be out of line. With the exception of one who called another student weird because he asked lots of weird questions out of nowhere. That was needed because he was getting on my nerves as well with those obnoxious questions. But I guess you could say that he said it to keep the peace because it brought peace to everyone at the table so we didn’t have to hear any more weird questions. Japanese people are very dedicated to whatever they do. Whether they work as a receptionist at the front desk of the Sanuki Club, a AJALT teacher, or the chef of a ramen shop, they do their best to make me feel happy and welcome. It’s a trait that every Japanese citizen has at work and I appreciate every minute of it because you do not get the same type of service in America. The dedication that Japanese people have should be implemented in America so that overall success and morale. Learning Japanese has also forced me to think about how I do things and learn about concepts in a way I am not familiar with. It is difficult to do but with the right mindset, I can think outside of my usual thought process and explore analytical concepts that I might not have thought of before. It’s almost as if I am thinking outside of the box, but instead of going left or right for an idea, I look up and there are thousands of other ideas I’ve never thought of before. Learning a new language that is completely different from English will help me in my thought process when I am doing research. 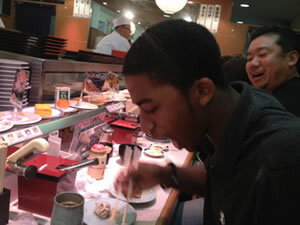 Failing to take my first bite of real sushi in Japan. This week during the KIP Forum we discussed how technology will disrupt the work force. My group went into great detail about what we thought would happen to the working class if technology continued to eradicate lower income jobs. I tried to make it so that one of the KIP students was the facilitator to be more assertive and controlling over the discussion and I would be secretary to take note of the key points in our discussion. At first my plan worked but then some of the American students that were in my group took over the discussion and it was hard to get the Japanese perspective rather than the American perspective that I was already aware of. I eventually started to ask KIP students their thoughts on the topic and they answered the best that they could. We were able to get a good idea of what the KIP students thought about technology taking over the working class jobs. When I presented our thoughts to everyone I realized that my speech was very long and I needed to make it simple but cutting out some parts. Eventually someone asked me a question about how technology would affect literature and liberal arts. I didn’t know how to answer it but in our discussion one of the KIP students who was a literature major brought up that point but he was very quiet during the discussion. I said that he would be able to answer the question so I kind of put him on the spot. I said what he had to say and answered the question brilliantly. Packard-san told me afterwards that this was his first year and he was very shy so what I did was...unorthodox. However, he amazed everyone by answering a question that was not directed at him and presented his thoughts clearly to an audience for the first time ever in English. That situation defines the KIP forums to me, allowing Japanese students to speak in English about social awareness that they might not be able to discuss in class and allow American students to get a Japanese perspective of these issues. Hanging out with one of the KIP students. Minami Sanriku is an experience that I will never forget. I’ve seen the devastation through videos online but seeing it all up close and personal really brought out true emotions and feelings. When we first arrived I saw where the water had risen 2 years ago. There is still no vegetation because of the salt water. The destruction of the town didn’t have a full effect on me until I saw the concrete bridge that was destroyed. After 2 years, Minami Sanriku still looks as if the tsunami hit a few months ago. Only when we started playing with the dindergarden students did I truly feel happy about what I was doing. I didn’t feel like I came because I was forced to by the program or to cheer kids up. I felt like I came because I wanted to feel happy and excited about a time in my life where my innocence still existed and all the stress from work and school was lifted because I had nothing to worry about. From throwing paper airplanes, to playing tag and having all the kids chance me, and playing Godzilla on the playground – it was the most fun I have ever had in a very long time. I completely forgot that a tsunami had destroyed this part of Japan and little progress has been done to restore the area. Eating beef tongue, gyutan, Sendai’s delicious delicacy the night before we left for Minami Sanriku. The next day we visited an elementary school and had a Chopstick Challenge where 5th and 6th graders had to build a bridge with limited resources in an allotted amount of time. Even though most of the students did not know English, I was still able to communicate with them through the Japanese skills I have learned during the past 3 weeks in Japan, but I mostly used hand gestures and the kids thought they were funny. This activity was about teaching students how to be resourceful and, most importantly, how to work as a team to accomplish a task. By observing their actions, my team could have come in first if they had more time. I definitely saw some future engineers by the way they worked together and the designs they came up with. I was very proud of them. The following day we had an extended recess with more elementary school students. I taught them a few games and they showed me the advanced version of dodgeball which was much better than the American version of dodgeball. Who ever knew you could have so much fun with one ball and some 40 people playing dodgeball all at once? Lunch with the students was a little more difficult to communicate with since I didn’t have any KIPP students to help me out. After we finished playing with the students, we did some community service for the people who live at the temporary homes. The older men who showed us what to do did not seem as enthusiastic to see us, but nonetheless we did our jobs. Afterwards the leader of the temporary homes gave us a short speech of how it has been before, during and after the tsunami. It was very moving and made cleaning up the gutters all the more worth doing. Then the man that Packard-san kept telling us about finally spoke to us told us how hard it was to talk about how he had lost everything including his family. That was very moving. To have a man who witnessed WWII, had some resentment against Americans, then share deep, personal feelings to us showed a lot of how much we have touched his life. Later that night we had a major feast and talked with more leaders of the temporary homes. To see everyone smiling after such a devastating disaster shows the impact that America has had on the people of Minami Sanriku. Lila and JJ had wonderful performances on the violin and guitar and their duet was phenomenal. Jason, Mitch and Mike singing more Beatles like it was karaoke, which was fun, and everyone except for me knew the lyrics - which was a little embarrassing. Since everyone was having so much fun, the leaders of the temporary houses decided to have another party at the lounge area. They were very welcoming and I hope that NanoJapan continues this relationship. I already know that when I start my car company, I want to send some money or rebuild parts of Minami Sanriku with whatever they need. I thought every aspect of KIPP was amazing. I got the opportunity to meet amazing people that where my age. I realized that Japanese people are not so different from us. I don’t know why I thought they would be complete strangers to me but now that I have been able to experience this rare opportunity, I don’t feel so ignorant about Japanese people. There isn’t much that I would change about the KIPP program. I feel very fortunate that most of the KIPP students I met are in Tokyo where I will be doing research the remainder of this summer. I feel bad that some of the other NanoJapan students do not get to hang out with KIPP students that they meet in their research cities. If I could change one thing, it would be to diversify the schools that KIPP students come from and try to make it so that every NanoJapan student gets to meet at least 2-4 KIPP students from their research city. 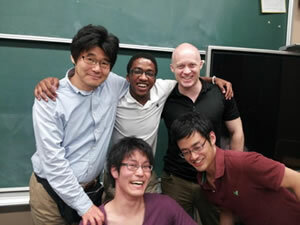 Me, Maruyama-sensei, Dr. Einarsson, and a few lab mates having a great time at my welcoming party. My first week of lab was amazing. One of my research mentors, Chiba-san, took me to the University of Tokyo to retrieve my luggage. We had a lot of spare time before I had to check into my apartment so he gave me a tour of the campus and the lab I would be working in. Coming from a small school, I was in awe of how big the campus and labs were. During the talks and presentations leading up to this moment, I was not sure how everything worked or how I would be using it. Luckily Chiba-san gave me a simpler explanation of how every worked. On our way to the apartment Chiba-san took me to this very cheap, yet very delicious restaurant called Yoshinoya. There he taught me some more Japanese words and phrases I should know that AJALT did not teach me. Chiba-san, my Japanese master research mentor, and Kehang-san, my Chinese PhD research mentor, are very cool guys. 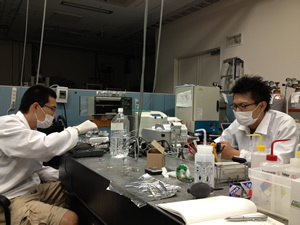 They seem to be the top researchers in Maruyama’s lab. 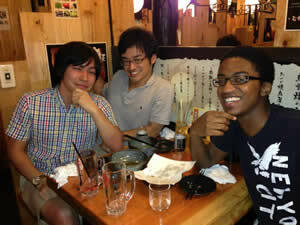 Chiba is highly respected by all the other Japanese students which makes me feel honored to be mentored by him. On the other hand, Kehang is highly respected by Maruyama-sensei. Every time Maruyama goes to a conference or forum, Kehang is always invited to come. He has already gone to Beijing for the first week and will be going to Finland next week. Even though I was not able to see him much the first week, he is very supportive in what I do and wants to see me succeed. My lab knows English fairly well. My lab is mostly foreign students, so everyone knows English. However, everyone prefers to speak Japanese. 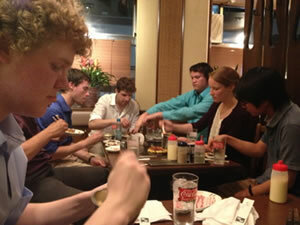 Even the foreign students prefer to speak Japanese. So when everyone starts to speak Japanese, it’s hard for me to stay in the conversation and I usually stay quiet. Whenever I ask them what they said or ask how to say something, everyone is willing to help me learn some more Japanese. My lab is more relaxed than what I am used to and everyone works on their own schedule. If they do not have class, they arrive whenever they want to which is around 9-10AM and leave whenever, which is around 6-8PM. I have gotten into this habit because I do not like waking up early to go to work and I don’t have anything to do at night so leaving late is not an issue. Plus I get to hangout more with my lab and get to know them. Everyone takes a 2 hour break for lunch so this is also why we leave later at night. 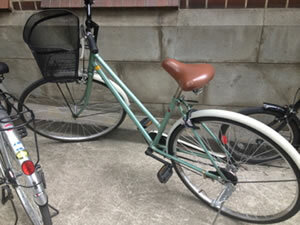 My awesome Japanese bike with the trademark basket. My commute from my apartment to the lab is much easier now that I know my way around the area and I have a bike. The bike shortens my trip from a 30 minute walk to a 10 minute bike ride. Buying my bike was not as easy as I thought it would be. Even though I went to a mechanic to buy a cheap bike. I don’t know how buying a bike in the US is like but buying a bike in Japan is equivalent to buying a car in the US. You had to register the bike and put down your name, address and some other information. The man I bought it from did not know any English and 3 weeks of Japanese language classes never prepared me to know the Japanese word for address (Juusho), or how to write my address in Japanese. Luckily I had Dr. Einarsson’s phone number and he was able to explain to me what I had to do. I also did not know my address or have it with me so I had to run back to my apartment and retrieve it. When I came back with my name and address, it took longer because there is a different way to write Japanese address in Japanese from a Japanese address in English. So instead of a simple 30 minutes it took me 3 hours to buy a cheap, used bike. For my project I will be studying the effect of various diameter vertically aligned carbon nanotubes (VA-SWNT) on solar cells. I will be growing the single-walled carbon nanotubes (SWNT) by ACCVD synthesis. The objective of the project is to enhance the absorption of VA-SWNT while increasing the voltage output of the solar cell. I will be using scanning electron microscope (SEM) to take imaging of the SWNT. I will also be using Raman shift and absorption testing to characterize the SWNT. My first day in the lab I did make my first sample of SWNT. They are vertically aligned. Kehang showed me how to make so technically I didn’t make it myself. I do have a better idea of what I need to do for my project after talking more with Maruyama-sensei. I need to make narrower and shorter VA-SWNT for my solar cells and test them in dye-sensitized solar cells. I will be observing the voltage and absorption of the carbon nanotubes. I will also be observing the correlation between the SWNT’s characteristics and voltage output. The main paper that my research will be based off of is the Diameter Modulation of Vertically Aligned Single-Walled Carbon Nanotubes by Einarsson and Maruyama-sensei. This paper helps explain how the diameter of SWNT has different electrical and optical properties as well as the physical properties. In 2004, the first reported SWNT array, which was synthesized by ACCVD was reported. This method has been revised by the Maruyama lab to replicate and synthesize narrower SWNTs. This report has shown that the band gap is inversely proportional to the diameter. Therefore, smaller diameter SWNTs are of interest for most electronics and optical applications. They have also discovered that the best way to produce smaller diameter CNT is not just by changing the CVD process, but also changing the concentration of the catalyst. The particles of the metal catalyst determine the size of the SWNT growth. The catalyst particles used for synthesizing VA-SWNT are normally prepared by sputtering or evaporation. These methods pose a challenge to because it is difficult to reduce the size of the metal catalyst particles while maintaining a sufficient density that is necessary for vertical alignment. The paper also explained that changing the concentration of the metal catalyst has a greater affect the growth of the VA-SWNT than changing the parameters of the CVD process. The CVD parameters in my experiment that are kept constant is the temperature, the pressure, and time spent in the CVD furnace. The temperature is kept at 800ºC, pressure is constant at 40kPa, and the substrates are kept in the furnace for 30 minutes. The temperature, pressure and time spent in the furnace mainly effects the height of the CNT but can also change the diameter of the SWNT. The concentration of the molybdenum and cobalt affects the diameter of the SWNT more than the CVD parameters. My research mentors and I have not discussed how I will be fabricating solar cells. We are more concerned with the characteristics of the VA-SWNT which will help us equate that to the efficiency of the solar cell’s power. I have steps of how to sputter a substrate with metals onto the surface, obtain data through Raman Shift and UV absorption. I am now learning how to analyze the data myself which will be key to my research and possibly a publication. During the beginning of the program I brought my skateboard. My friend Kofi, who participated in the program last year, said that he wished he had brought his skateboard. So I thought I might be a good idea to bring my skateboard and save some money by not buying a bike. The first three weeks were worth it because we lived in a community that had well kept sidewalks and recently repaved roads, Azabu-Juban. 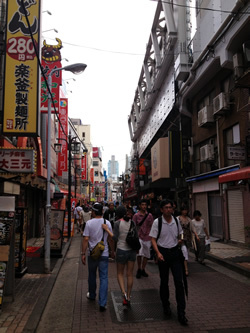 While I was living in Azabu-Juban, I had the impression that all of Tokyo would be the same as Azabu-Juban. I was wrong. When I arrived to my apartment and the University of Tokyo, I learned very quickly that skateboarding around my apartment would not be as easy as skateboarding around Azabu-Juban. Every time I would try and pass someone, I would say “sumimasen,” but I guess people in this part of Tokyo have bad hearing. On top of this the sidewalks slant towards the buildings. I guess this is to keep pedestrians away from the streets because it gets steeper as you get closer to the streets. There are probably a multitude of reasons why they do this like drainage, but all I really care about is getting to work on time. So I decided to buy a bike from a local shop in Tokyo one morning instead of skateboarding to work. Buying my bike was not as easy as I thought it would be.I originally was going to buy a bike from a shop for 20,000 yen, but then I saw a pretty good looking buy in a mechanic shop for 5,500 yen. I don’t know what buying a bike in the US is like, but buying a bike in Japan is equivalent to buying a car in the US. You have to register the bike and put down your name, address and some other important information. The older gentleman I was trying to buy the bike from did not know any English and 3 weeks of Japanese language classes never prepared me to know the Japanese word for address (Juusho). Everything was going so well until he asked for my address. I was able to ask how much the bike was, the condition of the bike, and even answer some questions about myself. But when he asked me my juusho, it was like he was speaking an entirely new language. I couldn’t speak or understand anymore Japanese. Luckily, I had Dr. Einarsson’s phone number and he was able to explain to me what I had to do. When Dr. Einarsson told me that he was asking for my address, I realized that I also did not know my address or have it on me. So I had to run back to my apartment and retrieve it. When I came back with my name and juusho, I still didn’t know that I had to rewrite it in the Japanese version, which is different from the way we write our American address. While I was waiting for the mechanic to fix the bike up, his wife came out to say hello. Then she asked me if I was thirsty. I told her “no.” I didn’t know how to say it politely so I just said “iie” with a smile so she knew I wasn’t trying to be disrespectful. A few minutes later she handed me a coke and gave me a Kit-Kat bar. I thanked her for it because I didn’t want to refuse the offer. It seemed normal for the women to bring the guest something to drink and eat. It is a universal tradition of hospitality. However, she then handed me a cup of green tea when I had not finished my coke yet. I told her I had just had breakfast but she kept insisting on my eating food. I wasn’t sure if this was the Japanese version of hospitality, or if she didn’t want me to starve. So instead of a simple 30 minutes it took me 3 hours to buy a cheap, used bike. The entire time I try to stay on the roads since these are somewhat safer because Tokyo has designated bike lanes. Just like any country, some people follow the lines, others do not, so I have to be very defensive when I commute. I have been told that the biggest crime that I have to be aware of is getting my bike stolen. Luckily I have a custom lock that came with my lock. As long as I remember to lock my bike up, I should be fine. Research Update: Not much has changed within the past week. I tried to synthesize 4 VA-SWCNT at once with the CVD. This process was unsuccessful because each one of the silicon substrates had a different thickness that was visible to the naked eye. I tried to transfer the VA-SWCNT to a quartz substrate but some of the SWCNT did not transfer like it was suppose to. I have to wait for Kehang to return before I start synthesizing anymore VA-SWCNT. Kehang is going to supervise me next time as I synthesis the next batch of SWCNT. I still have not learned how to read and analyze my graphs. I have an idea but I am not 100% sure that I would be able to understand all of it. There are not any rules in the lab that affect the way people interact with each other. Since my lab is very international, most of the students not only speak Japanese but also speak Chinese or Korean. My lab is very casual when talking to each other. The only person you should not be casual with is Maruyama-sensei. Maruyama-sensei was only here during my first week because he has many conferences and other international conventions to attend. Everyone in the lab is very friendly to each other, which is another reason why everyone is more outgoing that most Japanese students that I have met in other labs. In some ways, the lab here is very similar to what Prof. Kono and Dr. Einarsson told me during the orientation weeks. Even though I work with Dr. Einarsson, most people in the lab are minding their own business while they work. If someone needs to ask a question to another student, they politely interrupt them and ask a question. In many ways, my lab is very similar to the US labs I have worked at in terms of how people interact with one another. However, there are some differences in the Japanese lab that are very different to the labs I have worked in at Morehouse College and Princeton University. First, since master students have to do research in labs and have classes to attend, most students do not arrive to lab until after lunch. I am usually the first one in lab. Another difference is that unlike U.S. research labs, students do not leave the office until after 6PM or 7PM. This is probably because the guys in my lab have a break for an hour or two during lunch. I’m not sure if this is because Maruyama-sensei is not in the office, but once 2PM hits, everyone goes straight back to work. I actually prefer this because I can sleep in and still get all my work done for the day. Because my research takes a long time to complete, I usually stay in lab until 7PM or 8PM. Everyone thinks that I am a hard worker because of this which makes me look good in front of the sensei. One last difference in this lab is that a lot of people sleep on the job, or at their desk. I was doing this the first week because it felt so hot in the office. But they have been used to the heat much longer than me, so I was wondering is it o.k. for me to accidentally take a nap if I’m on my computer or reading an article? Cooking Takoyaki in the lab with my lamates. An Osaka speciality. Dinner at a steak restaurant with my labmates. Research Update: Nothing has changed in the past week. There have been no difficulties with my research the past week since I have not done anything different in the lab. I have mostly been reading papers. Over the past week I have not been able to accomplish much because most of my lab mates are at conferences. All I have been doing is make VA-SWNT. I have not made solar cells yet with all of the VA-SWNT yet. I do have a lot of data on the Raman shift and absorption spectroscopy. I will be sending this to my host professor now. This is a major problem for me because I can’t do as much research without the aid of my mentors. I feel more productive when they are here because I am more motivated to do work. I think my biggest accomplishment since I’ve been in Japan is simply learning Japanese. It has always been hard for me to learn a new concept in such a short period of time. Also I am surprised out how quickly I am able to speak and have conversations with other Japanese people. The other day, I was at a konbini, or convenience store, near my apartment to get some lunch. The entire time I was there I spoke Japanese. I asked one of the employees where the ice cream was located. I then asked if the ice cream had any nuts in them because I am allergic to nuts. She said it doesn’t have nuts and showed me on the book where it said there were no nuts. I then proceeded to check out and pay for all my food. She asked me if I had a point card. I didn’t have a points card and at this point I don’t think that I would need one. I should have gotten one when I first arrived, but I told here that I didn’t need one. When I was about to pay for it she asked me if I spoke English. I was a little surprised by this because I only knew how to say those exact phrases in Japanese. If she asked me anything else or if I needed anything else from the store, I would have broken out in English. She then started to speak English, very good English. On the other hand, one of my biggest challenges while I’ve been in Japan is planning and organizing what I should do outside of lab. Surprising as it may sound, there is so much of Tokyo that I have not seen yet and I need to plan a budget for the rest of the program so I will not be stressing out about running out of money. When I am at school, I usually plan on spending $200 a week which is not a lot because I don’t spend a lot of money while I am at school. However, I have been given this once in a life time opportunity to have the freedom to do whatever I want at my own expense. I have never had this opportunity before, so it has taken me a little longer to adjust to this life style. Helping my friend Teppei cook some Spanish cuisine for a party. 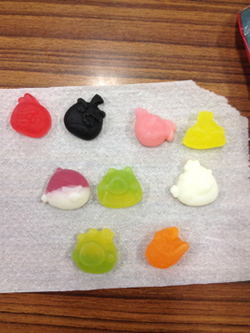 Some Angry Bird gummies from Finland the lab received as a omiyage (the black bird tasted awful). Research Update: This past week, I have had more progress with my research. This week I was able to construct my own solar cells. The dye-sensitized solar cells that I am fabricating at the University of Tokyo are slightly different from the ones I have been making at Morehouse College. The TiO2 is much thinner than the ones that I was making at Morehouse. The solar cells at U of T are also more efficient than the ones that I have been making at Morehouse. This is partly due to complex fabrication of the TiO2. The first layer of TiO2 is made so that the the sole purpose of the TiO2 absorbs the light or photons to create energy. The next layer that we place on the TiO2 is another layer of TiO2. However this layer’s main purpose is to scatter the photons that pass through the first layer of TiO2. This allows for any photons that pass through the first layer to be reflected back at the absorbing TiO2, increasing the number of photons being absorbed by the solar cell. Another difference in the DSSC that I am making is the platinum counter electrode and Iodolyte solution. The solution that we use has 50mM of tri-iodine in acetonitrile which allows for better conductivity. I did have a major set-back with my research last week. 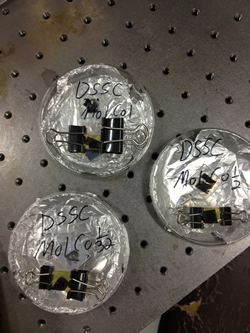 I was supposed to have had 6 new substrates of VA-SWNT and fabricated them into new solar cells. All last week I was unsuccessful in making suitable VA-SWNT for the solar cells. Every CVD test was an utter failure. The first few CVD test were rookie mistakes. For example, I forgot to turn on the hydrogen gas or the concentration of the molybdenum and cobalt were not ideal for the experiment. The SWNT yield on the substrates were not high enough for me to transfer the CNT to the platinum counter electrode. I do not have a set timeline with research or poster. I have been talking to my host professor about setting goals per week. I plan on finishing my report on what my research is about and how much work I have been doing so far by Thursday so that I have something to show to Prof. Kono on Tuesday. I will ask Dr. Einnarson is he can help me prepare for my meeting with Prof. Kono. I am not sure what we will be talking about so I will look over more emails to better prepare myself, or simply ask him when I see him in Okinawa. Language Progress To Date: My Japanese skills have not improved much since I have been on my own in Tokyo. Since Tokyo is a very international city and most people know enough English for me to have a decent conversation, I have not been put in a situation where I needed to use solely Japanese in a conversation. The only time I had to do that was when I had to buy my bike from the mechanic which I already talked about. Another reason why I have not needed to improve my Japanese skills more is because when I am in lab, I am usually around the PhD students and they are all foreigners, with the exception of one. Since I am around them more often than the Japanese students, they always speak English. Whenever I am around my Japanese friends though, I do try to speak Japanese. They usually sound confused so I try to explain it in English and it makes more sense to them. If there is a word that I don’t know in Japanese that I usually use in English like “may I borrow the [tweezers]” or some simple nouns and adjectives, I don’t hesitate to ask them “[tweezers] wa nihon go de nan desuka?” Listening to Japanese is still a major challenge but the easiest thing for me to do is to write it out or spell out the words so I know what they are talking about. Future Planning: At this point, before the Mid-Program Meeting, I am worried about a few things. I am worried that I will not get the data that I had originally planned to obtain. I originally planned on already fabricating solar cells by this point with VA-SWNT and using all of July studying how and why I got my results. Since Maruyama-sensei’s lab is very independent and everyone is working on their own, it has been difficult for me to do my research the past few weeks to get good results. I would mess up my experiment and learn from it, but then I would mess up another way and have to start over again. I this is what happen all last week so I feel like I wasted an entire week doing nothing. I know that this is very common when doing research as a PhD student, but I am not a PhD student yet and I do not have time to deal with these issues. Since I would be doing most of my work on my own, I would also have to be able to analyze my own experimental data. My friend Guy-san, who is graduating this year, tried to explain to my how to analyze the data from my Raman and Absorption Spectroscopy. This was very difficult because I am observing hundreds of VA-SWNT instead of a since VA-SWNT. This makes analyzing my data less accurate and more time consuming with understanding how to analyze my data as well as the process of how to analyze my data. This is only half of my experiment. The other half of my project is observing how the characteristics of the VA-SWNT affect the efficiency of the DSSCs. I have not made a single DSSC that has CNT as a counter electrode. With multiple deadlines approaching, I hope that I will be able to accomplish my goals before the deadlines. I think my biggest accomplishment since I’ve been in Japan is simply learning Japanese. It has always been hard for me to learn a new concept in such a short period of time. I have always had trouble doing this and this program has prepared me in a way that I never thought would be possible. When I was learning English, I had a huge issue pronouncing words. I still have this problem today but when I am continuing to learn another language, I am now including another challenge. Also I am surprised out how quickly I am able to speak and have conversations with other Japanese people. By the end of orientation, I felt like my Japanese writing skills would be excellent and my speaking skills would need more improvement. However, I could say easy sentences like “how are you?”, “where is this?” or “It’s very hot.” Being in a lab that had no A/C and living in an unfamiliar area made these phrases easy to remember and for starting conversations. Since I’ve been on my own, I have not been using Japanese very consistently like everyone told me I would. I only use phrases that are relevant to daily understanding and conversations. This way I only speak Japanese when I need to. Any phrases relating to food are important because I am allergic to nuts. When telling people that I am allergic to nuts, they think that nuts are the same as seeds. So they typically tell me that sesame seeds exist in the food or sauce, which is ok with me. There was one instance where I told them that I was allergic and they brought me a plate of cashew nuts along with my entrée. The worst incident was when I asked the waiter if he spoke English. He said he did and I told him that I was allergic to nuts and asked him a good dish without nuts. He brought out a curry and in trusting him, I ate the curry. The curry was very delicious but halfway through my lips started to swell and I broke out in an allergic reaction. I should have gotten the [Select Wisely] international allergy card like the NanoJapan Program told me to do before I left. That would have come in handy when going to Indian, Chinese, or any new restaurants since I couldn’t read the menu. Since I am mostly talking to PhD students 6/7 are foreign students, I usually don’t speak Japanese. But I do try to hangout and talk to the other 20 Japanese masters and B4 (senior undergraduate) students. When I talk to them, I always ask them “how do you say ____ in Japanese?” This keeps my Japanese speaking skills in check. Unfortunately, I often forget the words the next day. I manage to learn quite a few words though. Since I understand the sentence structure, it makes using the vocabulary words easier thanks to the Japanese language classes. 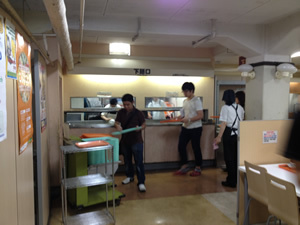 Separating trash for the janitors. Part of my post-lunch routine in Japan. Research Update: Pertaining to an update on my project, I will not be trying to expand the range of diameters like I originally planned. I do not have enough time to make more VA-SWCNT, characterize them, make DSSCs, and observe there efficiency within the next two weeks. I will be focusing on controlling the diameter of the four VA-SWCNT that have been published and compare what I have found with there results. The yield for the concentration of cobalt that is 1/128 of the original concentration is not as good as the other concentrations (1, ½, and 1/32). If I do not get an good yield within the next few days, I will not be using the 1/128 in my analysis. I will need more work on improving my presentation skills before I give my presentation at the Tokyo symposium. Luckily, I can practice every Wednesday because of our weekly meetings that last for 4 hours. I usually use that time to read more papers and articles I downloaded. This way I can spend more time doing experiments in the lab. I completed my abstract which was fairly easy because I have written abstracts in the past. I am not entirely certain of the purpose of my project so I will talk more with my mentors and host professor about why I am doing this project. Long nights with my friends and mentors, Kehang and Zun (Guy). This large CVD and I can only produce 2 samples every hour unlike my mentors who can make 4 every 30 minutes. Maruyama-sensei has weekly lab meetings for his students. They usually last about 2-4 hours, depending on how long we rent the conference room. During the lab meeting, everyone has to give a powerpoint presentation on what they have been working on in the past week and what they plan to do for the upcoming week. After, each student gives a presentation, Maruyama-sensei would give feedback to the student, criticize them on the presentation or research, or ask them more details about their project to make sure they are on the right track. The first few weeks of presentation I thought I had an idea of what I was doing. I would show them a few pictures of some terrible graphs and tell them what I would do the upcoming week. I did not have a problem the first few weeks because I was still learning about how to do my project and researching how CNT and DSSC worked. However, I did procrastinate on making my powerpoints because I did not have much to present and thought I would not need a lot of time to work on my powerpoints. I found out that this would become a major issue when presenting my research to the lab. Presenting research, no matter how insignificant you might think the results or disastrous your experiment have been coming along, is still important to the group as a whole. For 2 weeks I was not able to produce a significant amount of CNT on my silicon and quartz substrates while Maruyama-sensei and my mentor, Kehang were at a conference in Finland. Some of the problems were my fault because I would do some of the steps incorrectly, but for the most part I did not realize that some of the parameters for the chamber had been changed and wasn’t sure how to change them. I asked a few people who were around me how to change them but they did not know how to change it to my settings. But when it came to presenting what I had done, my presentation was confusing to my audience. I had several weeks of confusing presentations and this was very critical to me. I had to improve my presentation skills before the midterm meeting and the Tokyo Symposium at the end of the program. When the Midterm Meeting in Okinawa was over and I had to give a presentation to Prof. Kono, Sarah, and Packard-sensei, I was very nervous and unprepared. My mentor told me that the best presentations are the ones that tell a story and flow from beginning to end. I had an idea of how my story would look but since I was nervous, I jumped around in my presentation and skipped some important facts. After my presentation, I got a lot of heat and criticism and advice on how to improve my presentation. I was very disappointed though because I knew what I had to do, but since I was not prepared or organized, I felt as though I had embarrassed myself, Maruyama-sensei, and my school. As a representative from a lab that has sent home the best researchers and has had high expectations for their NanoJapan students, I had failed Maruyama-sensei. This was a very crucial point in time of my research because it was like a wakeup call to do better and work harder. I knew that I could do better and I have not been studying my research as in depth as I should have. Ever since the Mid-Program Meeting, I have been studying the papers more in depth and analyzing my data whenever I got the chance. I have also been preparing my presentation a few days in advance so that I can review them and practice my presentation. Sure enough, the hard work and dedication payed off at the Tokyo Symposium. By practicing my presentation before the symposium and being able to edit my powerpoint, I felt more confident in myself and my nerves subsided before I went to the podium to speak about my wonderful Japanese experience and research. Maryuama-sensei was unable to attend the symposium but Kehang was there to support me and when he told me of how great my presentation had gone, I was very proud of far I was able to improve my presentation skills. Made my first solar cells all by myself. Feeling of accomplishment!! 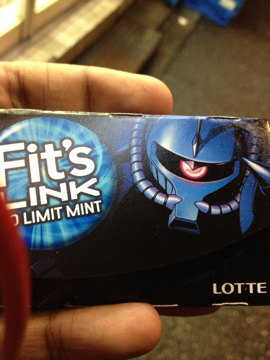 Gundam style gum at a local konbini. I interviewed a friend in Japan named Keigo. He is pursuing a degree in mechanical engineering as a master student and got a bachelor’s degree in mechanical engineering also. He said that being a student in Japan was similar to being a student in Japan except he didn’t ask questions at the end of class or talked to the professor often. He liked how American students always asked questions in class. He had one job at McDonalds but that didn’t last long. He told me he wanted to pursue a career in engineering as a researcher, but not in the type of research that he was doing with Maruyama-sensei. Life in Maruyama-sensei’s lab was stressful yet relaxing at times because of the high stress. He had very high expectations of me because of past NanoJapan students and I hope that I was at least close to reaching them. From left to right: Keigo, Masanori, and me. This was m first time at a yakitori restaurant. Maruyama’s lab was similar to the lab I worked at with Dr. Stone at Princeton University except Dr. Stone seemed more relaxed with the work than Maruyama-sensei. In both labs, I would arrive at my own time and leave late due to the experiment’s long testing or fabrication process. I actually preferred working late because I was more productive at night, I wasn’t a morning person. However Maruyama-sensei expected me to pull a few all-nighters like previous NanoJapaners and I think one all-nighter was all I could pull. I think the best part about working at the University of Tokyo was the wide range of international students. My lab had about 12 international students out of 25 graduate students. I always enjoyed talking to them about their home country and what they missed about it. I would always say that I missed the space in the American working space but at the same time I realized that it wasn’t necessary and I eventually got over it. The international aspect of working in a research lab has opened my eyes to how important international awareness is in research. I am working with people from around the work, read papers from around the world, and even met other professors working in the same field as me when they came to give presentations on their research to our lab. If I am able to start my own lab, I will make sure that I have a fair number of international students with prior international experience. Coming from a historically black college (HBCU), I really can’t express how important having an international awareness or experience is in any STEM field. My advice for students interested in research is that first off, you will read lots of papers so you should start to enjoy reading if you don’t already like me before the program. I would also say that you need to tolerate flawed experiments because that will happen on a regular basis and you will need to learn how to overcome those difficulties when your experiment does not go according to plan. My last piece of advice is to learn to tolerate and, if possible enjoy, different cultures and nationalities. The reason I say this is because if you were to pursue research as a career when the field is becoming more international, the best way to interact with each other is to have a normal conversation outside of research. Because honestly, who really wants to talk about research 24/7 when you can also talk about each other’s cultural experiences. They might just give you advice… and money for your research. Before I came to Japan, I did not have a major assumption of what I would expect from the Japanese culture. I assumed that everything would be smaller, everything would be written in Japanese, and I would eat a lot of sushi and ramen. After living in Japan for 3 months, I have realized that most of those perceptions where true, but had an underlining meaning and purpose. The reason everything is so small and buildings and streets are close together is for efficiency. If the buildings are close together, that means that you can have more offices per square mile and walking is shorter. I did eat a lot of ramen in Japan but not so much sushi. Sushi is considered to be a snack or special meal for a special occasion such as eating out for a celebration. However, ramen is a common dish for lunch and dinner because it is quick and easy. It is basically Japanese fast food without the grease and precooked foods. Ramen is actually a Chinese dish which really surprised me when I found out; and this goes to show how close relations where with China and Japan hundreds of years ago. My personality has changed a lot since I’ve lived in Japan. I feel more aware of the environment and conscious of my natural surroundings. I definitely have gained a larger global perspective of problems that will impact not just my community but now other countries and the world. I have a greater appreciation of Asian cuisine and culture now. I thought that most Japanese people were typically reserved, but after meeting multiple Japanese people and getting asked do I need help, I found out that Japanese people are really no different from Americans. My research goals and career goals have not changed much since my goals and career plans have been unchanged for the past 4 years. I have solidified my decisions on continuing my research in batteries and material science. I have made multiple contacts that will help me reach my long term and short term goals. The NanoJapan Program has a large alumni base at Stanford, where I plan to obtain my PhD. I have also found out that there are serval professors at Stanford and other California school that are currently doing research that correlate to my research interest. In the Spring 2014semester, I have already made arrangements to participate in an exchange program with Stanford and then finish my undergraduate degree in material engineering at either GATech, USC, or University of Michigan. I look forward in finishing my undergraduate degree now and am certain that the PhD program is for me. My last week in my research lab went by so fast that I had almost forgotten to get gifts for my professors, mentors, and even my guesthouse roommates that have supported me throughout the past 2 months. I gave Terao-san some American chocolates because she was very sweet and helpful in making my stay in Tokyo more enjoyable. I gave Chiba-kun some Kool-aid and 5 Gum. I knew that he did not like sweets that much and the gum was not an insult to his breath, it was not bad. I gave it to him because he always shared information with me whenever I ask him a question, even if he didn’t know how to translate it to English or have a good answer. I gave Kehang-san a hat from Ame-Yoko, American Street, which wasn’t very American. The hat was cool but had a lot of random words on it that had a theme to it. It takes time to understand the theme, but once you got the theme, you could understand the impression it was trying to give off. Kehang-san kind of talked like this which made communication difficult throughout the research lab. Now Maruyama-sensei was a little more tricky for a gift. I got him another fanny pack. He always carried around a fanny pack everywhere he went but I was never sure if ever used it for recreational activities. So I got him a fanny pack specifically for that. The reason I got him this was I would use my USC backpack for professional business and recreational business but realized that as my bag got dirtier, it became less professional. I didn’t want this to happen to Maruyama-sensei so I got him one for his recreational uses and he can still use his professional one for all the times he goes to international conferences. 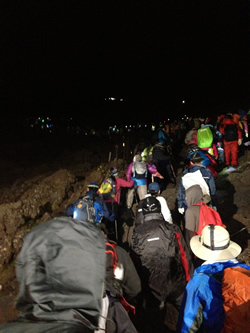 There is a back up on the side of Fuji-san at 2AM. Lots and lots of people. 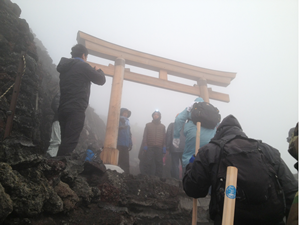 Getting closer to the top of Fuji-san. Research Symposium in Tokyo: Presenting my research poster in Tokyo was different from presenting in America. It was shorter than what I am used to and I had to talk more about my experiment because the Japanese style for poster is to have more pictures and less words. Therefore I really had to understand my research like the back of my hand. I think that the symposium was a great good way to end our research experience in Japan. Meeting ambassadors and other professors I have not met before and telling important people the importance of programs like this for undergraduates in America and Japan. Re-Entry Program and RQI Research Colloquium at Rice: I think that the Re-Entry Program discussions were helpful in bringing my entire Japanese and research experience to a closure and learning the best way to exploit it’s importance. I think the resume building session and interview practice sessions were the most helpful. It helped me realize some of the good interview habits as well as the bad habits that I can improve for a real interview. When, I anticipate, they will ask me how the most influential experience in my life has built me to be a better researcher and overall person. When I came back from Japan, the first thing I noticed was how open and spaced out everything is. Even though I was in Texas, I know that the rest of America is like this and I saw this as a waste of space. Writing this final report makes me realize how great this program has opened me up to opportunities and possibilities that I’ve never thought of before. I look forward to telling everyone about my experience in Japan and showing pictures. I think the most challenging thing would be adjusting to American culture. Since I was so used to the Japanese culture and way of life, I will probably hold on to it for a while. Follow-on Project Plan: Going back to what I originally planned for my Follow-up Project, I don’t think I will change anything. I will still give a PPT presentation to my peers at college about Japanese culture and research in Japan. I have already planned a date to give my presentation to my organization on campus (Society of Physics Students). I will also go to an elementary school and give scientific demonstrations about easy concepts in science as well as teach children how to use chopsticks.